3.5 stars. This was a good, solid mystery book. In a way, it’s Sherlock Holmes fanfiction reclaiming the original series for women (in a similar way that Elementary the tv series functions). Arthur Conan Doyle’s stories are classics for a reason, but the casual sexism is undeniable and for a modern reader like myself, it can be hard to swallow, “the woman” Irene Adler or no. 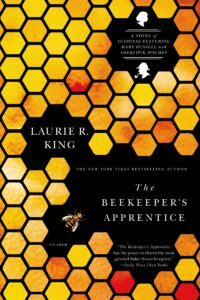 The Beekeeper’s apprentice examines what it would be like if an older Sherlock had a female protege. Holmes meets Mary Russell by happenstance when she’s fifteen. He takes her for a boy at first and is taken aback by Mary’s quick and logical mind. He’s practically gobsmacked when he finds out she’s a girl. They quickly develop a strong teacher/student bond and over the years he tries to teach her everything he knows. They make an interesting and enjoyable partnership. Over the course of the book, they solve little mysteries here and there until they run into a nemesis on their level. This would have made for a great vacation read. The mysteries are almost like little vignettes since there’s so much time passing in the book as Mary and Sherlock build their friendship and partnership. I’m not sure I’d call it a cozy mystery, but it’s close. It’s just a really feel-good story about two people coming together to solve crimes using their wits, developing a strong friendship over time. Share the post "Move over Sherlock Holmes"
This reminds me, I need to read the next several of these! MsWas got them for me last year and I haven’t touched them. Project!! This one was very soothing in a way. I think I’ll save the sequels for when I need out of a book slump or want something chill. Will be very curious to see what you think!